Water usage can be reduced by up to 60% by taps with a timed flow of 15 s.
Balancing the need for safety with high-quality finish and practical design in changing and washrooms is a challenge for sports and leisure schemes. Nicki Cox of Reliance Water Controls explains. More than 20 years ago, the American Society of Sanitary Engineering published a paper that is still widely regarded and referenced for scald-risk assessment. The paper highlights that water at 60°C will cause third-degree burns in adults in less than six seconds, and less than one and a half seconds in a child. At the same temperature, second-degree burns can take effect in less than three-quarters of a second. Such statistics reinforce why temperature control is absolutely critical in areas of public use and low supervision — such as leisure facilities. The leisure sector is expected to utilise products such as taps and showers that deliver high performance across multiple outlets and combine intuitive design and aesthetic style to meet customer expectations. 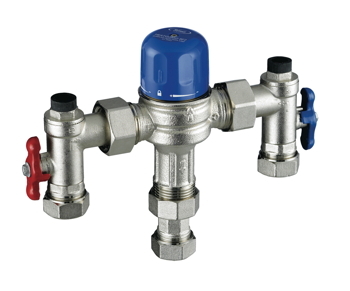 Added to this, TMV3 thermostatic control is necessary to ensure that water is delivered at safe temperatures. Water efficiency also being a key target for the sector adds to the challenges of balancing these demands in what is already a competitive marketplace. With the over-riding need being the protection of users from both scalds and potential sources of infection, the use of thermostatic mixing valves (TMVs) in taps and showers is the main priority. TMVs ensure water temperatures meet the requirements for killing legionella and pseudomonas bacteria, whilst remaining safe at point-of-use for members of the public. Mixing hot and cold water to a preset temperature at the outlet ensures that infection control is maintained, whilst removing the risk factor associated with scalding hot water at the outlet. Mixing hot and cold water at the point of use using TMVs ensures that infection control is maintained, whilst removing the risk factor associated with scalding hot water at the outlet. 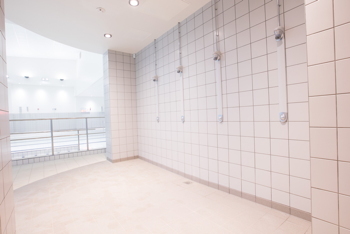 Thermostatic control for leisure centres can be achieved either with group TMVs controlling a bank of showers, with individual TMVs and showers or thermostatic showers with an in-built TMV. Trends in the sector are showing a move towards the last approach, as it represents a better balance of thermostatic and infection control, and simplifies maintenance, as servicing one shower outlet does not affect adjoining units. With targets on water management and energy efficiency a big focus in the industry, instances of misuse can have a significant impact, especially when dealing with areas of high thoroughfare and minimal supervision. Timeflow taps and showers and anti-vandal shower heads are important considerations in any commercial environment where supervision is low. The impact of downtime in terms of loss of income and expense of repairs can be substantial, and of course prevention is better than cure. Timeflow taps can combat this risk by reducing the ease at which an outlet can be misused. With preset flow rates, energy and water usage can be managed much more effectively. A study conducted on behalf of Reliance demonstrates that a 15 s timed operation of a tap can reduce water consumption by up to 60%. Adhering to regulations and managing water usage and energy efficiency doesn’t need to mean a compromise in design aesthetic. With organisations being rated on the quality of their facilities, product design plays a key role in the selection of washroom fittings. In leisure centres, the washroom environment is particularly important as it’s an integral part of most visits, and users of the facilities are likely to use them on a regular basis. High-traffic facilities must also consider the need for ongoing maintenance. Pre-plumbed and ready-to-connect shower panels have seen a huge growth in recent years, and with easy-access panels for all serviceable parts there has been a surge towards user-friendly and service-friendly installations. This further enhances the user’s experience by minimising downtime and loss of service. Showers with their own TMV to control delivery temperature and be serviced and maintained individually. This installation is in Olympia Leisure Centre in Belfast. As well as the requirements of thermostatic control, efficiency and aesthetic design, leisure centres are also subject to Part M of the Building Regulations Volume 2. This sets out the specific needs for access to, and use of, buildings that aren’t residential dwellings. BS 8300:2009 Inclusive Design British Standard gives advice on designing facilities for all, whether able bodied or with any kind of physical impairment, again a key consideration for leisure centres. Physical disabilities may mean it is not feasible to use hands to operate taps or showers. With extended levers, knee-operated levers, pedal operation and recessed floor switches, outlets can easily be controlled by elbow, knee, foot or wheel. For those specifying water controls for leisure facilities, the array of legislation means that expert technical advice can be invaluable in ensuring the best selection of fittings. Nicki Cox is senior category manager at Reliance Water Controls.